Rapiers are a long bladed sword usually with a characteristic complex hilt that is constructed to protect than hand wielding it. 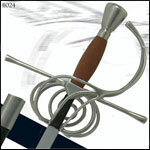 The rapiers in this section are designed with a high degree of quality and an emphasis on performance. We understand that you are looking for premium quality pieces at a reasonable price, whether your needs be LARP or decorative. With that in mind we bring you these. Kingston Arms Blunt Fencing Side Sword. Designed for safe use in fencing practice, the Renaissance Side Sword provides a realistic fencing simulator to the renaissance period HEMA practitioner. Gustav Main Gauche Antiqued came about when King Gustav II Adolf (1594-1632) was monarch of Sweden from 1611-1632. The Hanwei Practical Rapier 37 inch Blade by Paul Chen has an SCA-approved 37 inch Schlager blade. The tapered blade form provides superior balance compared to the traditional parallel-sided schlagers of the same length, making for a faster sword. The Hanwei Main Gauche Wood Grip by Paul Chen trace their origins to early 17th century Europe, where swordplay with the Rapier was considered an essential part of a gentleman's education and was often used in resolving gentlemanly disagreements. Our Hanwei Pecoraro Sabre by Paul Chen is one of the rapidly growing arts within historical fencing societies is that of Pecoraro Sabre fencing in the late 19th century Italian style, originating with fencing masters who were employed to train mounted troops in the effective use of military sabre. This Hanwei Practical Cup Hilt Rapier by Paul Chen is designed for the rapier fencer with a preference for the cup-hilt style who wishes to spar in safety, our Practical Cup hilt Rapier and Main Gauche fit the bill perfectly. Our Rapier Replacement Blade is the only 43 inch Schlager-style replacement blade for the SH1098 Rapier (hilt components not included). Our Hanwei Rapier Replacement Blade 37 Inches by Paul Chen 37 Inches by Paul Chen is the only 37" Schlager style replacement blade for the SH1099 Rapier (hilt components not included). The Hanwei Practical Rapier Blade by Paul Chen will enable three of our most popular rapier models to be converted quickly from live blade to practical sparring blade configuration. Fits: Solingen Rapier SH2205, Torino Rapier SH2204, Gustav Rapier SH2206. The Hanwei Sabre Replacement Blade by Paul Chen is a replacement blade for the Pecoraro (SH2199) and Radaelli (SH2200) sabres. This Hanwei Swept Hilt Rapier Wood Grip by Paul Chen features classical lines, with a high-carbon steel flex-tempered blade, a stainless steel hilt and a hardwood grip. The Hanwei Practical Rapier 43 Inch Blade by Paul Chen utilizes the popular hilt from the SH1027S Rapier, modified to accommodate our SCA approved 43" Schlager blade (see Model SH1098 for the 37" length). The Hanwei Radaelli Sabre by Paul Chen is replicated from an original piece with remarkable balance, durability, and swiftness.The hilt design developed by Radaelli has been reproduced in our fencing sabre with a stainless steel guard and a wire-wrapped imitation sharkskin grip.